Local 3338 of the Canadian Union of Public Employees represents over 1200 workers, mainly at SFU campuses. Our diverse membership is spread among 7 Bargaining Units, with 7 different employers. Unit 1 are SFU workers in clerical, support, library and technical positions at SFU. Unit 2 are support staff for CUPW Vancouver local. Unit 3 are the Food and Beverage Service workers at the Highland Pub, Higher Grounds, Ladle and catering departments of the SFSS. The cleaning staff of Best Facilities are Unit 4. Unit 5 are support and advocacy staff people at the Simon Fraser Student Society. Unit 6 are the employees of the Graduate Student Society. Unit 7 are the employees of the Simon Fraser Public Interest Research Group. In 1972, CUPE 3338 started its life as the Association of University & College Employees (AUCE) 2, a feminist local with 660 members, and the sister of AUCE 1 at UBC. Our union remained a largely independent organization for almost 20 years. In 1989, the United Steelworkers of America tried to raid AUCE 2 but was unsuccessful. After a second attempt, the members decided to join Canadian Union of Public Employees (CUPE), the largest public sector union. In May 1992, we were certified as CUPE local 3338 and remained an autonomous unit within CUPE. In 2008, the local voted to join CUPE BC, part of a national union that just celebrated its 50th anniversary. CUPE 3338 now represents 1200 members and represents a wide and diverse range of units. Unit 1 continues to represent support staff at Simon Fraser University (SFU). 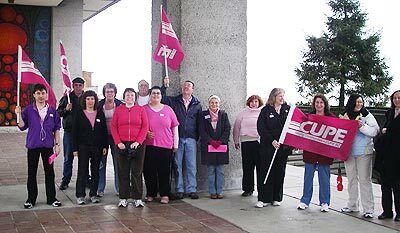 Unit 2 joined in 1988 when another feminist union, the Service, Office and Retail Workers Union of Canada (SORWUC) ceased to exist. The rest of the units either joined after making the decision to unionize or were the result of a merger with some members of CUPE 2396 at SFU. Out on Campus, Copy Centre, Build SFU and the Women’s Centre. 2009 The last 2 units were formed after a merger with CUPE 2396.